Electrical couplings and connectors are tested for insertion forces (assembly) and for withdrawal (extraction or disassembly). Consistent insertion force is vital for security of electrical connection and rapid assembly line throughput. Extraction resistance must balance ease of intended disconnection with integrity under intended conditions of use. For accurate and repeatable testing, pull forces and speed of pull are ensured by using a motorised tester, such as the Mecmesin WTST series. For correct alignment of the insertion, customised mounts can be designed by our engineers to suit individual types of connector. These tests may include current drop recording during the extraction. For connectors designed for regular maintenance and replacement, these are likely to be forces of similar order. Pre-test conditioning may be a factor to be taken into account where temperature and corrosion is a common factor, leading to higher extraction forces. Snap-fit connectors and locking spade terminals will require much higher forces to test the assembled tensile strength, compared with insertion forces, so test machines require the greater capacity. 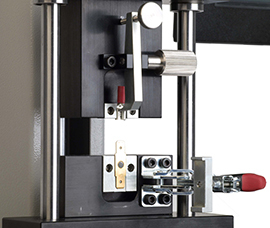 Mecmesin tensile testers all have interchangeable intelligent loadcells, making them versatile for many different kinds of test, and are programmable for all regular routines.